Greetings traveler. Welcome to my humble Patreon page inn. You must be thirsty! Hang on, let me pour you a drink. There we go. You won't find better in these parts. Name's Daniel. I’m making a little indie game for the PC called Innkeep. Innkeep is a micro-RPG, where instead of travelling around a fantasy world and stopping at inns, you run a fantasy inn, with the travelers of the world coming to you. I’ve been plugging away at Innkeep since 2015, logging my ongoing progress through Twitter, YouTube dev videos, and blog posts. Go have a look! I hope you can see that I've put a lot of energy and passion into this project so far, and that the result of all this labor is going to be something quite unique. So, Innkeep is a game set in an Inn? Yes. 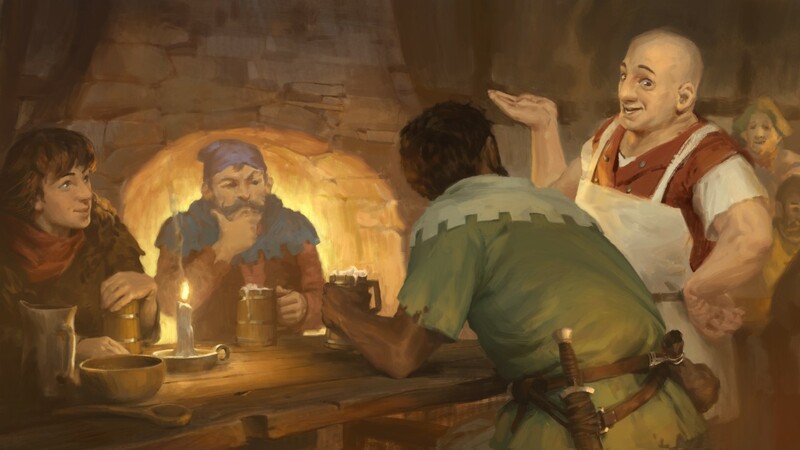 Inns and taverns have been a staple location since the dawn of the RPG. They are places for players to rest, buy supplies, or maybe get a lead on the next quest. In Innkeep however, it's your turn to wear the apron. As the innkeeper, you’ll need to look out for the needs of the guests who visit each day, serving them ale, sharing rumors, and maybe telling the odd joke. You’ll hire bards to play music, and get “creative” in order to cook appealing meals in a period of scarcity brought on by war. The twist is that your are not just any old Innkeeper, but something of a Thenardier-from-Les Miserables type fellow. You don't only look after your guests. You "look after" your guests: robbing your them as they sleep. During the day you are on the lookout for identifying the guests that have something of value. Maybe a well-off merchant. Maybe a bragging adventurer. Sometimes it will be quite tricky finding out who has something valuable, and where on their person or luggage it is stored. You will need to spy on your guests while you serve them, eavesdrop on their conversations, and use your silver tongue to worm your way into their confidence. Of course, there are only so many hours in a day, and so you will need to learn to pick and choose where to devote your attention among the numerous guests that might be staying on any given night. Once your mark is fast asleep you can let yourself into their room in the dead of night, prying open backpacks, wiggling rings from fingers, slipping chains from necks. If you have done your job properly, they should be far too drunk to notice a thing. But don’t take too much. Or from the wrong people. Or they might kick up a fuss and blow the whole operation. Is this primarily some kind of management sim? I like to think of Innkeep as a micro-RPG. That means a strong emphasis on player progression, dialogue, and hand-crafted characters. Over time, you will collect conversation skills that will help you keep your guests happy, and learn their secrets. Meanwhile, the guests who visit your inn each day are each unique. All of them have something to share, but not all will give up their secrets easily. And because you only have so much time in a day, you will never be able to hear everything that each guest might have to say. Some dialogue choices and associated actions might also change the broader course of events in the world outside of your inn. Put simply, along with serving drinks and keeping your guests happy, your other main task will be to use your conversational skills for the sake of exploring the dialogue possibilities of the people who visit. A visually detailed play space that you inhabit and improve over the course of the game. Day and night phases, with dynamic, atmospheric lighting. A unique vanishing-point perspective, with walls and floors of the inn fading out of the way to reveal what is behind them, somewhat like opening up a dolls-house. 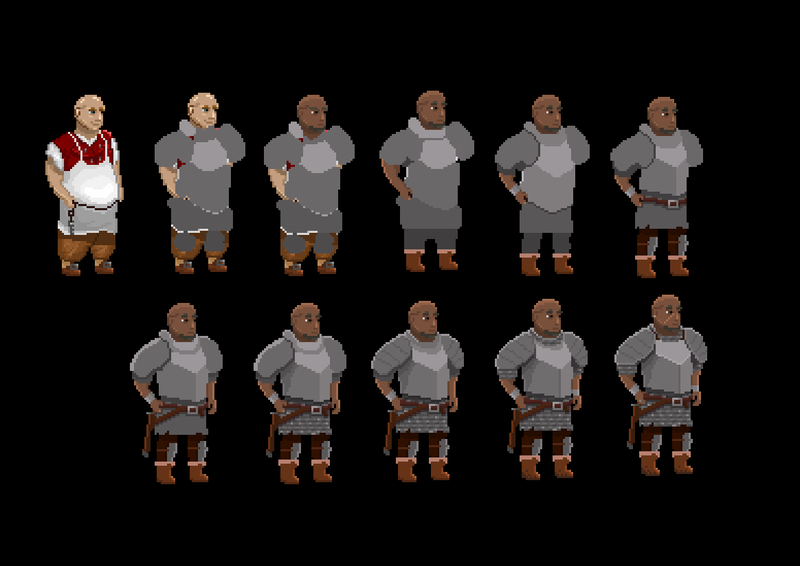 A host of individually hand-crafted guests, each with unique dialogue, and a unique sprite. A challenging core game loop, revolving around identifying marks, keeping your guests happy, and finding nice trinkets to steal late at night. An unfolding narrative which responds to player choice. Musical tracks that are incorporated into the game, played by the bards you hire to entertain your guests. The ability to collect and share rumors, stories, and jokes. Eventually I would like to find a publisher and carry out some fundraising, so that I can shift to full time development for the final push. For the time being, however, Innkeep remains a part-time project. What your Patreon support helps me to do is cover costs such as internet hosting and software, as well as any fees I might give to artists and such as commission for contributions to the project. The lovely art piece you see above, by the very talented Torgeir Fjereide, was commissioned entirely with money donated by my Patreon supporters. So, you’re helping keep this show on the road. Along with my undying gratitude and access to Patreon only material such as music demos, supporters who have donated an equivalent equal to the retail price of the game (possibly around $20) will receive a copy. Supporters also get their name credited in my dev diary videos, as well as in the final copy of the game. For some long time supporters I plan on giving some extra in-game recognition by naming guests or items (such as drinks) after them. Are you collaborating with anyone? Yes! The music for Innkeep is being composed by the musical hobgoblin John Halpart, who produced the track for Heat Signature. I occasionally share tracks by John to my Patreon supporters. Will this game ever actually be finished? And when?? Yes. And "when it's done." Sometimes I go pretty quiet for a few months at a time while crunching with my day job. But this project is something very special to me that I intend to see through to the end. While it is fairly ambitious in its way, it also, I think, not wildly ambitious. It may take a few more years, but during that period you will be able to see a steady completion of different core parts of the game experience. So, now that you've read all of that, why not start out as a $1 supporter? If everybody who followed me on twitter pitched in that much per month I would be well on my way to working on this project full time! Well, the evening is late. Let me show you to your room. Oh, and if you hear anything during the night, don't pay it any mind. The building is old and tends to creak a bit of its own accord. A warm and happy feeling. Access to any future patreon-exclusive material. Your name in the dev-diary videos. Copy of the game if your donation over time is equivalent to the sale price. A deep sense of contentment. A copy of the game when it comes out if your donation over time is equivalent to the sale price. Your name represented in the game as a guest or item.